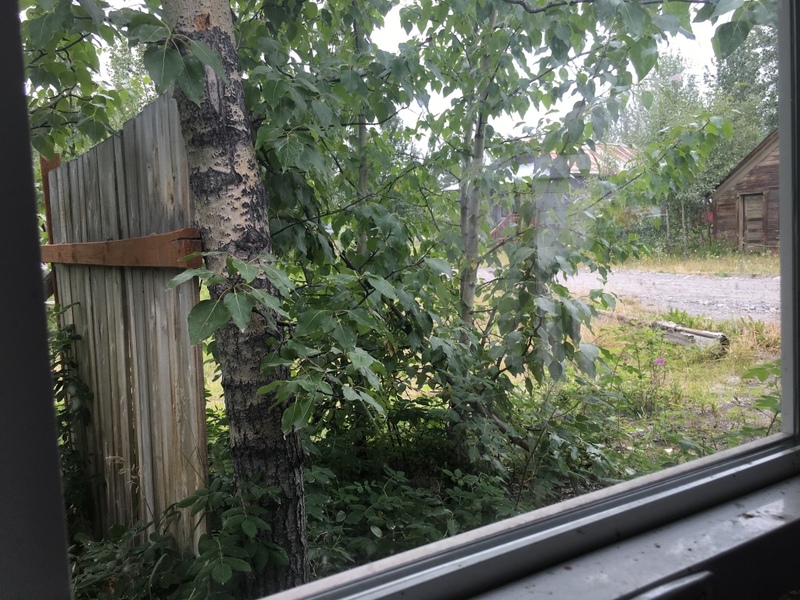 I am working out in McCarthy, Alaska right now. It doesn’t get any better than this. 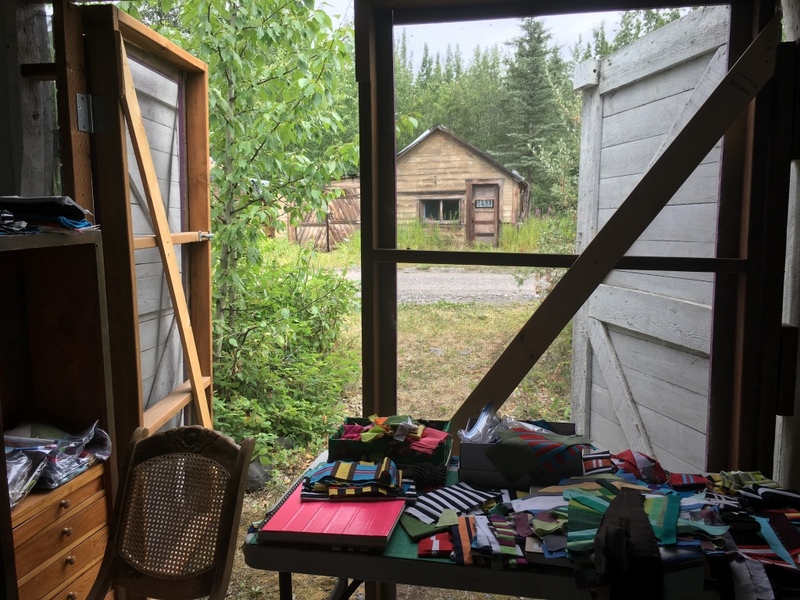 I am stitching away in the Wrangell St. Elias National Park. This is our cabin looking pretty spiffy with a new paint job. Around back on the right side is my studio. I didn’t even know that term existed, but it is a real thing. 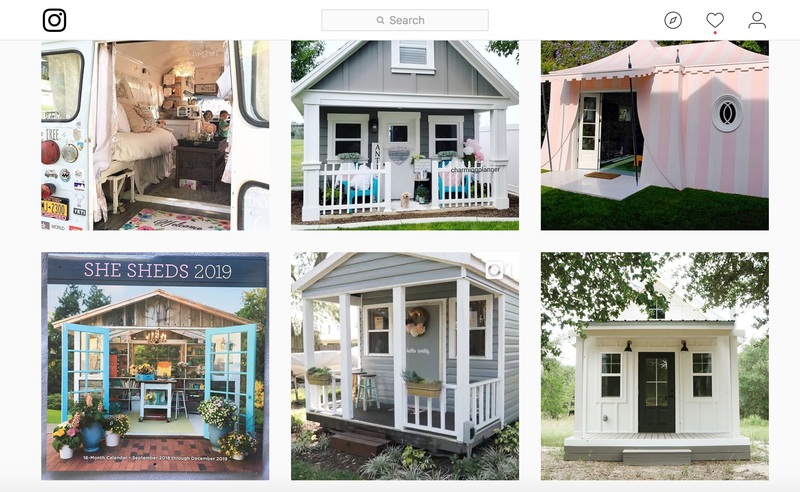 There’s more than 42,688 images with the hashtag #sheshed. Sometimes I think I must be living under an ironing board. So yes, I have a She Shed. Not as fancy as these decked out numbers, but it is highly functional. My “shed” originally stored a Model-T Ford circa 1920. 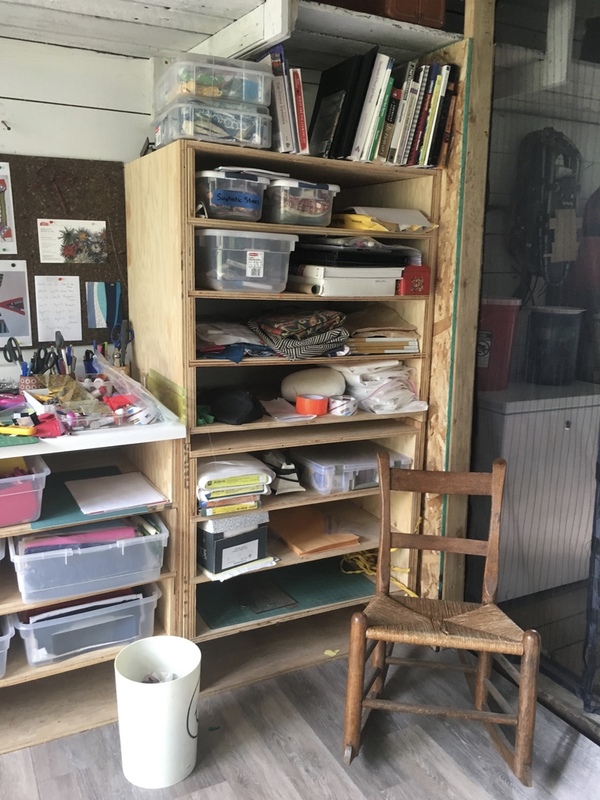 We divided the space so the front half of the former garage is my studio and the back is storage. I debated about cleaning the space up for you folks to look at, but I decided not to. 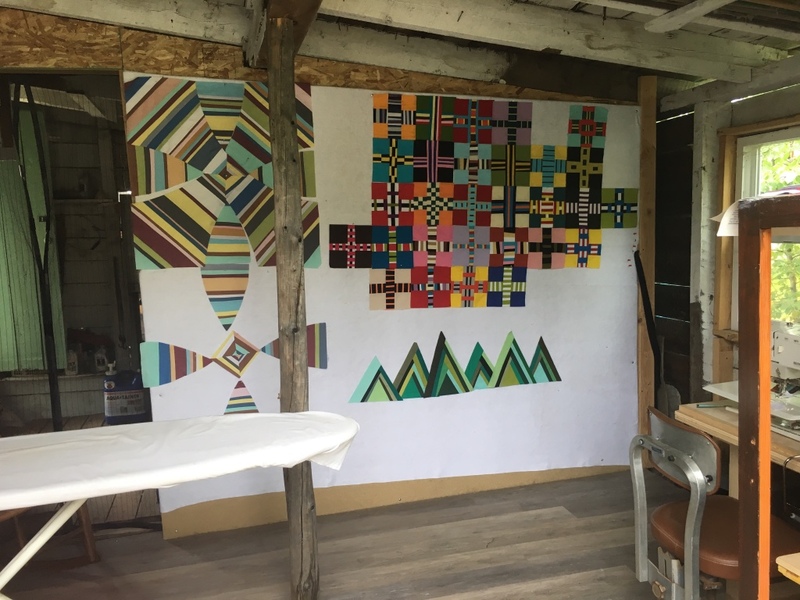 Which means this what the studio looks like when several quilts are in progress. The space is about 10 feet by 14 feet with the design wall located on the longest wall. In fact, this design wall is bigger then the walls I have in Anchorage. We finally fully attached the felt covering to this wall. The only drawback is the support beam in the middle of the room, but I am not complaining. The wall is not level. How do we know that? Well, he wall is covered in a squared piece of fabric. Look at the lower edge of the design wall–that is the lack of squared-ness. You can expect a bit of settling with a 100 year old house built in a sub-arctic climate. 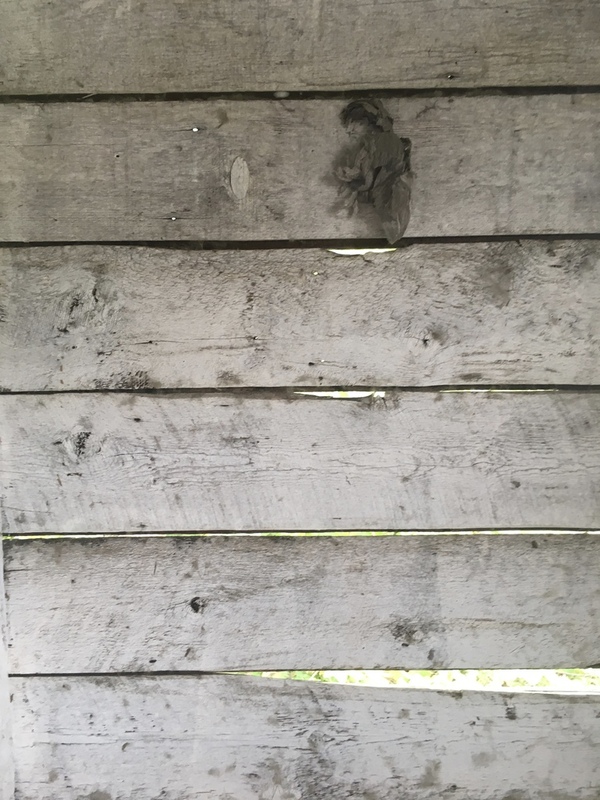 The gaps in the wood provide a lovely breeze but prohibit winter time use of this space. I must always remember to pin everything on the design wall down. More than once, I have showed up the next day to find that my work has been blown all over the place. On a hot day, the sunlight twinkles through. My friends know that if the barn doors are up, they are welcome to stop by. We chat while I work. The space is powered by the sun. Thank you Sustainable Arts Foundation for granting me the funds to buy the solar system that powers my iron. Since the last time I wrote about my plein air studio, I got a new sewing table and new flooring. My husband hauled every bit of this studio out here and installed it for me. Thank you Walt. It is good for the locals to know, that If you stop in the middle of the road to gossip, I will hear you. It is my favorite place in the world to be. 28 Jul	This entry was published on July 28, 2018 at 5:24 PM. 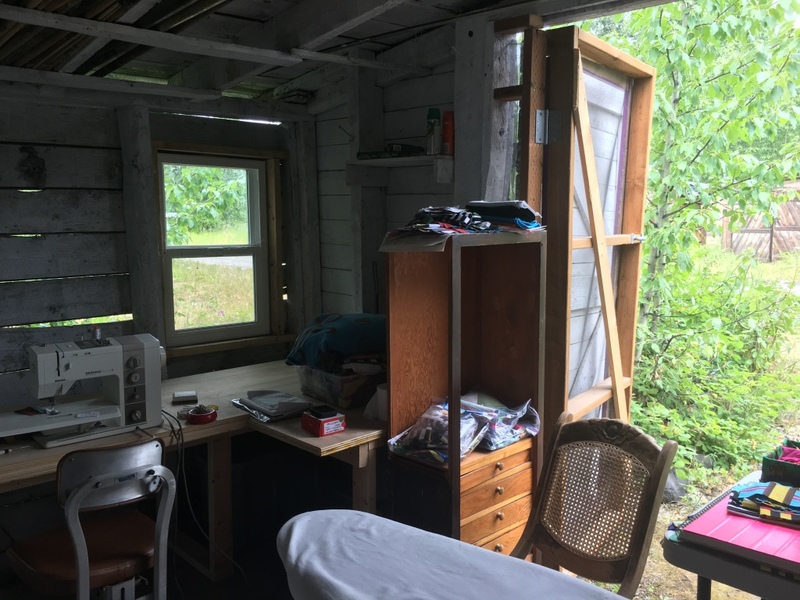 It’s filed under Alaska, McCarthy Style, Thoughts, Thoughts and Opinions and tagged McCarthy Alaska, MXY Sewing Studio, Sewing Studio, She Shed. Bookmark the permalink. Follow any comments here with the RSS feed for this post. Great post Maria! The tartan is looking fabulous! Thank you Beth! It is about time I finished that quilt! 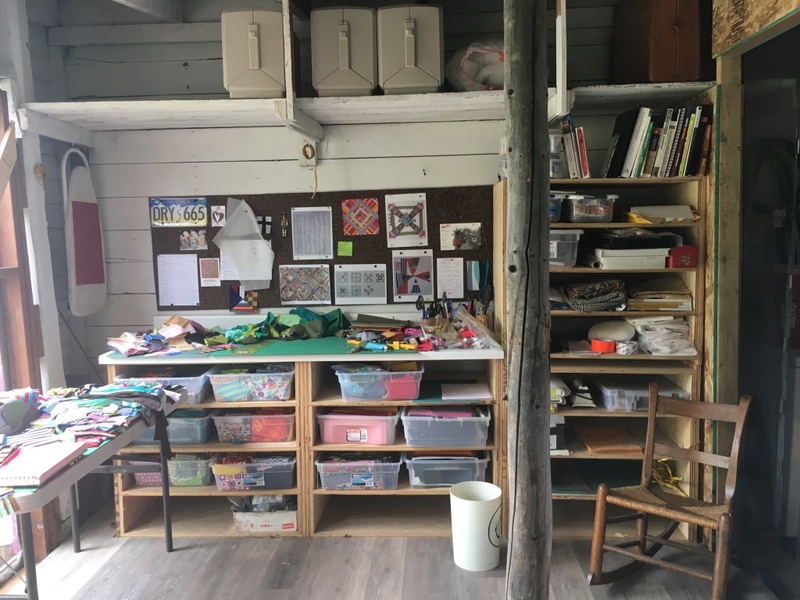 I always worry about the “state” that my quilting space is in. But now that I see a real artist at work, I see that my own space is just a creative retreat. Those green peaked pieces on your design wall remind me of the mountains in Colorado when I drive up from Denver to visit my daughter. Heading for Grand Rapids in August for the quilt show. Am excited that you will be there next year. Be sure to eat at Leo’s. Thank you for the food recommendation. I will look Leo’s up. I have a dear friend in Grand Rapids and I truly enjoy teaching for AQS, so I know that teaching experience will be great. That is exactly what I hope those green triangles look like! Oh Maria I always get a smile on my face when reading your posts. What a marvel you are. Thanks for the tour of your SheShed! What a delight it is. I am sure you do love working there. Hugs. Thank you Jill! It is the best place to work really. I am glad you liked the post! I am teaching in New Zealand in 2019! I can’t believe I will be going to your corner of the world. Lookiing forward to it! 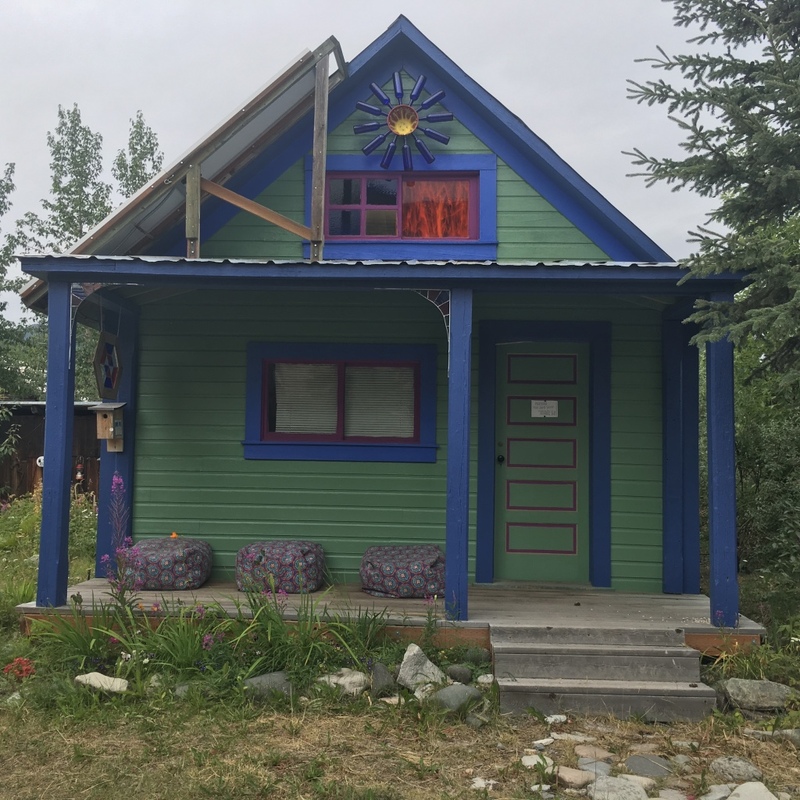 My friend Betsey Howard, Anchorage posted pics of her visit to the Kennicott area. Now I’m getting another visit to McCarthy. 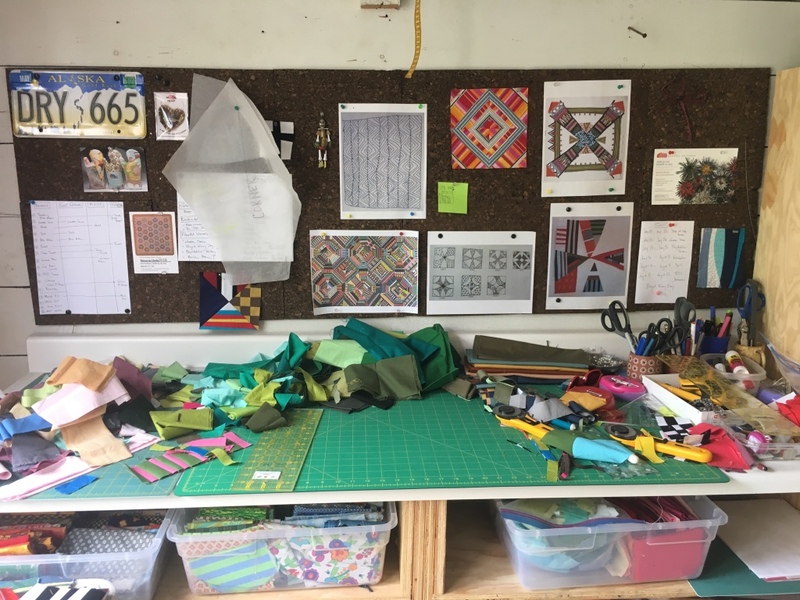 Always inspired by this Quilting life you’ve created. Thank you Linda! I am very lucky person. It looks like a wonderful place to work. I love that last photo of you with your design wall. I like it too. One of my visitors took the photo and sent it to me. I hope you are enjoying your summer Marla! Looks like a wee slice of heaven to me. I’ve told DH that Washington is getting too crowded for me! Your “she shed” has heart. Wishing you well ! Thank you! I hope you are doing good too! Tamara you are a creative at your core! I love it when you visit! Totally cool! Thanks for sharing! Like the new flooring. What do you do about the critters who might be seeking shelter during the colder months? Do you tote all your fabrics and books back and forth so they don’t become beds, nest lining, etc? Does McCarthy get a lot of the big flies and mosquitoes that plague other parts of Alaska during the summer months? Good questions Vivien- We have voles in our woodshed, and this past winter for the first time ever, we had mice/voles in our cabin. I have not seen any evidence of them in my studio. The only problem I have had so far is that the pins I leave in the design wall rust and the rotary blades do too. At times, we do have flies and mosquitoes. I will burn a mosquitoe ring if I have too. Thank you Vivien! 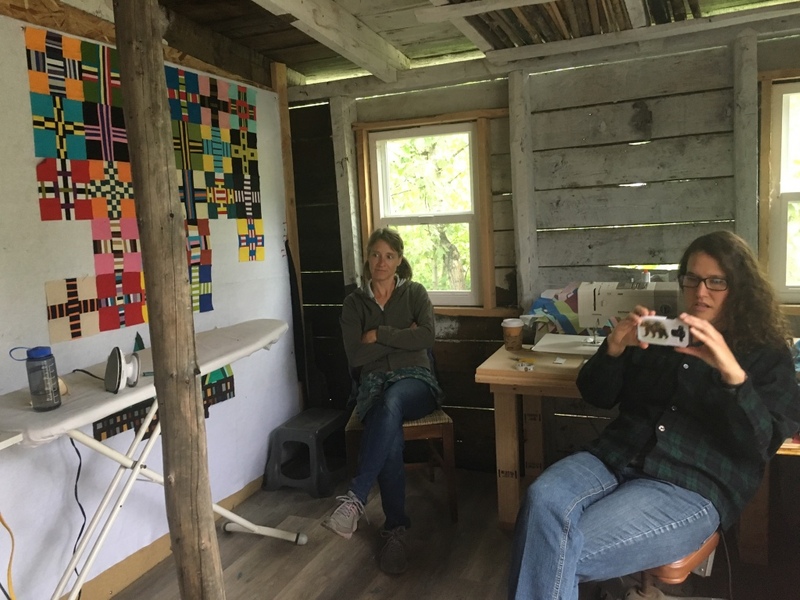 Thank you for the studio visit and I look forward to watching the green and black project grow. I have been meaning to send you an email to thank you for your excellent book which I purchases a few months ago but only got around to reading this month. I am not sure wether I will become an improve quilter, I try never to say never. 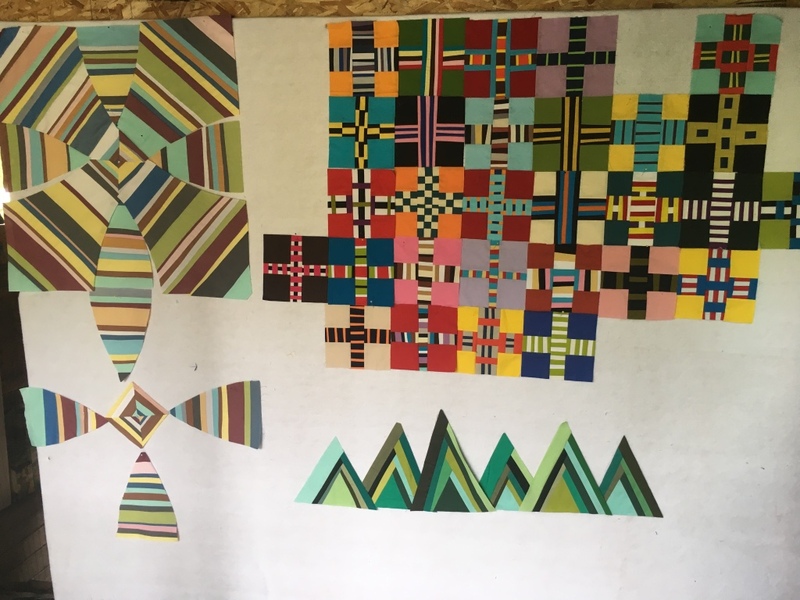 This month I have been working on a quilt that uses applique and patchwork, my favourite, the border I am just finishing has square in a square blocks using 1″ finishing to 1/2″ strips. Reading in your book how to cut accurate strips using the ruler and the lines on my cutting board plus how to press properly means no fudging, they fit together perfectly. Thank you. Thank you Bev! Pressing is incredibly important when you are dealing with the those thin lines of fabric. 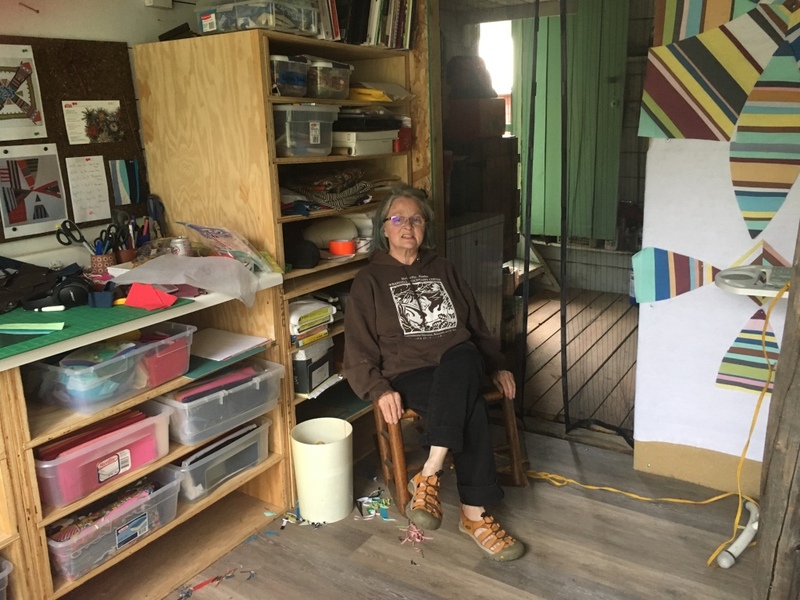 What a delightful studio you have built, Maria. Enjoy your summer here. Love your big design wall! I have a nice sized one, but it seems I could always use a little more space for those multiple projects! Thank you. This is so lovely. Maria, I love that you don’t let a few ventilating cracks in the walls, or neighbors stopping in slow down your creativity. I am a former Anchorage gal myself, and really enjoyed the times I went to McCarthy to escape the “big city.” That was in the 1980s. Wow. That means you took the tram across! My first visit was in 2001 and I have been coming back every year. In 2009 we got the cabin and the rest is history. Unfortunately, it has started dumping rain, so I will be moving the stitching into the living room where there is a cozy fire. Thank you for stopping by.
. The effort was worth it! One time I flew in. 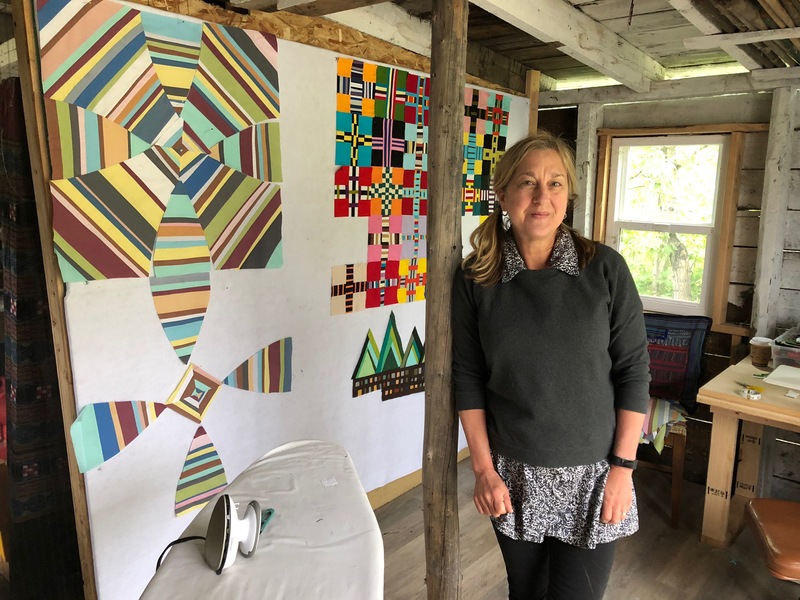 I am considering signing up for the workshop that you are teaching at Quilted Strait in March. I hope you join us at Quilted Strait. It sounds like a wonderful venue. I have heard only good things about it. I don’t know about that tram. I have seen photos of people hauling all kinds of stuff. Just dangling there over the raging Kennicott! 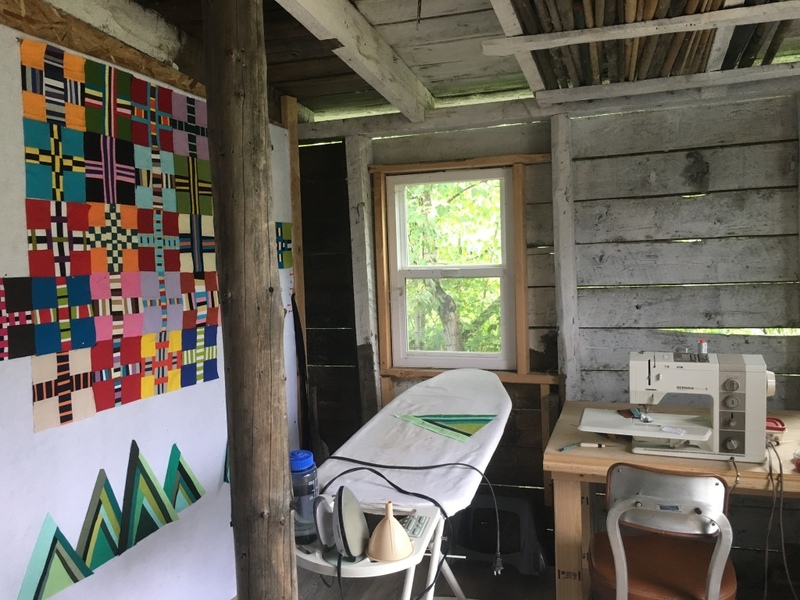 I signed up this morning for your workshop at Quilted Strait! Looking forward to getting the supply list! I cannot wait to meet you and enjoy the quilting adventure! Pt. Gamble/Quilted Strait is a wonderful venue! I have taken several workshops there, including 3 of Gwen Marston’s multiple-day workshops. The tram crossing was a bit harrowing, but so worth it. And, yes, you cannot believe what people hauled across. Looking forward to meeting you at Quilted Straight! And perhaps you will share some of the 80s AK adventures.